Chocolate Pineapple Confetti & A Happy Friday! I love (maybe an understatement) dessert, especially a really good one that hits the spot and satisfies the sweet tooth craving. In trying to eat healthier all the way around, dessert was one of the first things I had to reevaluate. And this gal doesn't like giving up her sweets. So I compromise sometimes, other times just indulging anyway, and find ways to make my sweets not so bad for me. When my sister-in-law introduced me to the brilliant idea of melted chocolate on pineapple, I quickly became obsessed. It's my go-to these days when I'm itching for something sweet. Not to mention it's simple and quick, and the only prep involves cutting the fresh pineapple up into bite size pieces. Mind you my bite sizes are quite small, just the way I prefer them. And I also love it best when the chocolate has hardened back up, giving this simple dessert a lot of great texture! So here's how you do it: use a fresh pineapple only; I can't imagine using canned for this (yuck!). Cut it up entirely, saving what you won't be eating in a tupperware (makes for an easy remake of the dessert next time). Melt a handful of semi-sweet chocolate chips in a microwaveable bowl (only takes about 35 seconds), stir, and drizzle. For kicks and a little extra crunch I added sprinkles this time. 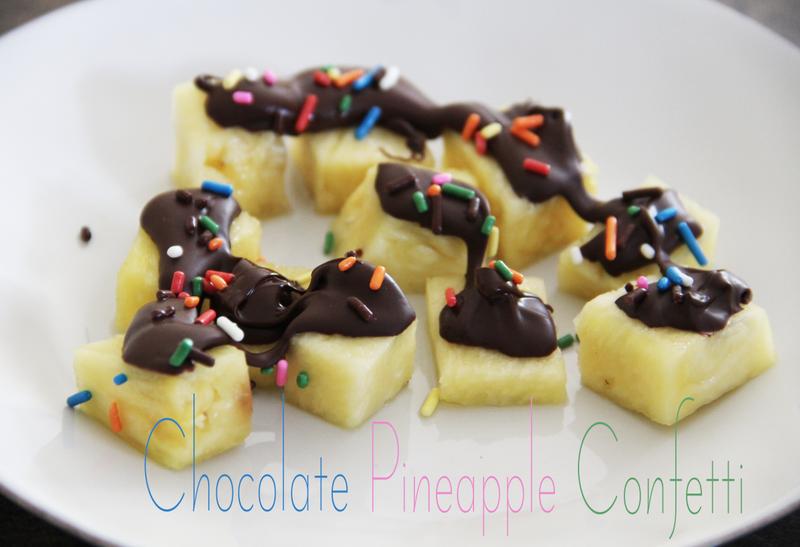 Hence the dessert name, Chocolate Pineapple Confetti. Plus, the added color somehow just made it tastier! Now go cut up some pineapple and try this treat! You'll be hooked too, I guarantee!